To compensate for the lackluster QLED experience from 2017, Samsung is betting now on the MicroLED technology that seems to be better than the current OLED solutions form LG. 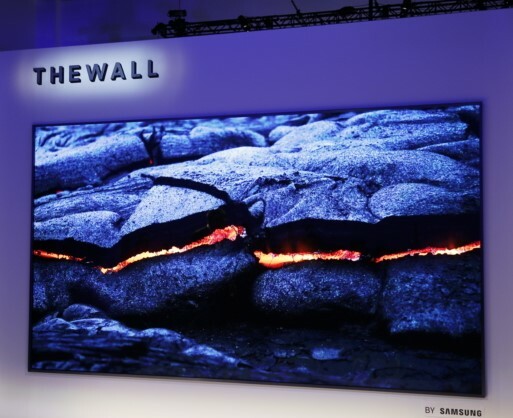 The Samsung First Look panel at CES 2018 showcased a 146-inch modular MicroLED display named "The Wall", which features 8K resolution and AI-based upscaling algorithms to improve the available FHD and 4K content. There’s no denying that Samsung is the largest electronics maker in the world, but this status could have downsides as well. Take for example the OLED TV market, where Samsung reluctantly denies to step in, considering the organic technology less reliable and prone to burn-in problems. Instead, the South Korean company tried its hand with the QLED technology last year, but its implementation failed to impress, as it is not really true QLED. Samsung will try to improve it, but it looks like this will not be the only venue for future TVs. Announced in late 2017, the MicroLED displays should enable Samsung to settle the score against the OLED panels from LG and regain the title for best display technology once more. At the First Look event from CES 2018, Samsung unveiled the world’s first modular display with MicroLED technology measuring 146-inch diagonally. Dubbed “The Wall”, Samsung’s mammoth screen integrates and innovative modular system and bezel-less design that enables users to customize the size and purpose of the display. The MicroLEDs are self-emitting and their size needs to be less than 100 micrometers, which is rather tricky to achieve at present. However, the MicroLEDs do not contain any organic materials like the OLEDs, so the durability and the luminous efficiency, together with the absence of the burn-in risks, should prove superior to LG’s organic LED technology in the long run. Resolution-wise, the panel presented at CES 2018 has an 8K resolution, but higher resolutions are possible with additional modules. Another innovative aspect of the modular MicroLED display is the AI technology used to upscale FHD or 4K content to 8K resolution. This uses a proprietary algorithm that analyses the scenes to enhances details, reduce noise and restore edges. No word on HDR support, but the improved luminous output should easily allow for it. Samsung did not release any information on availability and pricing, but the first commercial MicroLED displays are expected to hit the market in late 2018. I stepped into the wonderous IT&C world when I was around 7. I was instantly fascinated by computerized graphics, be them from games or 3D applications like 3D Max. I like to keep myself up to date with all the new technologies that get released at an ever increasing rate these days. I'm also an avid SciFi reader, an astrophysics aficionado and, as of late, a crypto geek.